Is it just me or is 2015 going at a cracking pace? Before I know it, Easter eggs are on sale in the local supermarket and we're in March already. How crazy is that? Another challenge I set myself, which I'm struggling to do, is read 10 classics this year. So far I've managed one a month (The Hobbit in January and The Sign of Four in February) and I'm keen to continue the trend. So this month, I've picked up Pride and Prejudice. I've read it in the past, but I didn't really enjoy it (ducks behind the table as Jane Austen fans hurl things in my direction) and have subsequently forgotten the majority of the plot. So here I am, attempting to read it again from scratch. Thankfully the chapters are short so I'm giving myself a goal of three chapters a day so that hopefully by the end of March, I will have finished it. Other than that, I'm pretty open-ended as to what I read. I don't have any particular book that I'm dying to get to right this second. 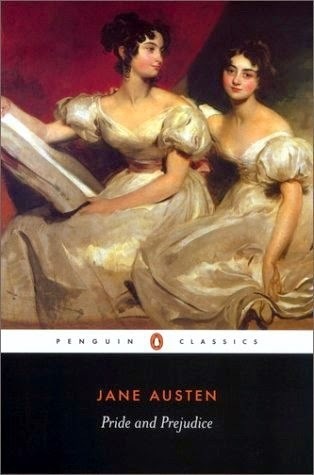 I'll probably pick up something light-hearted to break up the seriousness of reading Pride and Prejudice. What are you planning on reading this month? Wow, I see Percy Jackson there. I have yet to read Blood of Olympus but I'm not that keen to read it. I find that each book is repetitive and quite predictive too. I like the first series of Percy Jackson but the second series, not so much. Still, I am looking forward to see how their adventure will continue.